No commercial electrical installation job in Tampa, FL is too large or too small for us to handle. When it comes to commercial electrical installation, it’s essential that you have someone on your side who will do the job right. At 5 Star Electrical LLC, we can complete your commercial electrical installation job in a time-sensitive and professional manner, thanks to our experience and commitment to customer service. • Electrical Improvements – From basic outlet installations to complete renovations, our team has the experience and knowledge to help you create the perfect environment for your company. • Safety & Security Systems – With our electrical installation services, we can take into account all of your business’ safety and security needs. Whether you want to install new security lights or upgrade an old panel, we are here to help. • Specialty Lighting – The lights your business uses play a large role in the safety and efficiency of your operations, as well as how much energy your location consumes. With our solutions, we can help you discover the right types of lighting for your specific operations. No commercial electrical installation job is too large or too small for us to handle. We care about providing your business in Tampa, Florida with excellent services that are complemented by open and honest communication at all times. 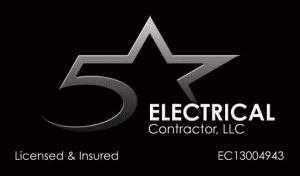 To find out more about how we can help you or why we’re the right ones for your electrical installation job, give us a call at 5 Star Electrical LLC today.